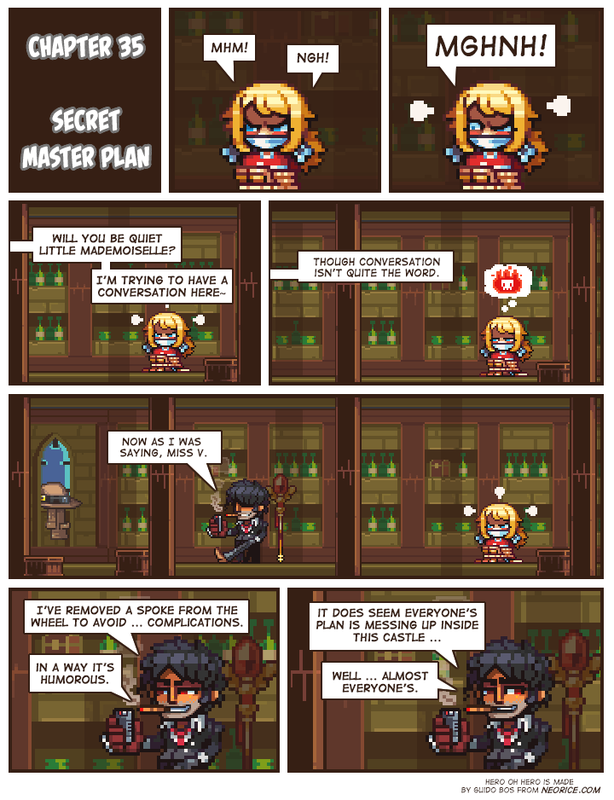 Chapter 35: Secret Master Plan. Now what sort of shenanigans are you up to, Guy? Also, dunno exactly how Piper's powers work yet, but going to go ahead and assume that she can't explode people with the power of her mind. Hmm, so we're still in Burkland...and Guy's speaking French. Is she being kidnapped for her own safety, for proper kidnapping or to allow the criminals a better chance to escape? Although, from the conversation, it sounds more like she's being kidnapped because her presence was a potential disruption to Guy and probably Veda's secret plan. Looks like someone can't cast spells while gagged. A spoke from the wheel....intriguing. I guess it must have been Guy (or an associate thereof) who hired the thief girl, whose actions set all these events in motion. I'm guessing her powers work like the judge's, she needs her amulet. @ Jack: I'm guessing that her amulet is her staff, particularly that large gem at the top of her staff. ...Well. Didn't see that coming. Suddenly Guy is waaayyyy more sinister. And here I was thinking he could be trusted, what with being nice to Noah and all. He's a policeman in an authoritarian country, and an associate to a spooky magic woman. Plus he has red eyes, like some other ominous characters. I wouldn't trust him even with my neighbour's children (and I hate the brats). I appreciate how his clothes are just hanging on the windowsill. @ Darius: you know, I completely forgot she had a staff and I didn't notice it was there till you mentioned it. I'm not sure how I did that.